B.C.’s Valley Pulp & Sawdust Carriers Ltd has hauled a lot of different materials in its decades of operation—but the company has now expanded its operations to hauling logs in the B.C. Interior, and it is working for several forest companies operating in the region. 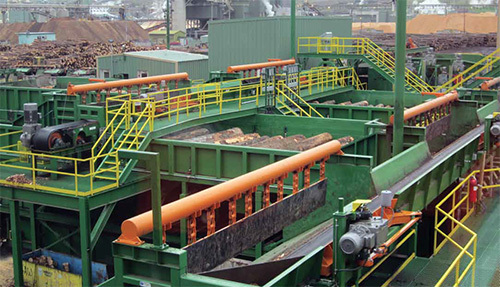 Watch for the story on Valley Pulp & Sawdust Carriers in the next issue of Logging and Sawmilling Journal (Photo courtesy of Valley Pulp & Sawdust Carriers). The City of Prince George—home to the Canada North Resources Expo—is celebrating its 100th birthday in 2015, and it has a rich sawmilling heritage over that century. Log Commander Enterprises, owned by the Webster Brothers—Ryan and Curtis—of Quesnel, B.C. has chosen to seize the moment in the logging upturn, expanding their fleet of logging equipment by a factor of four in the last 18 months. Forest company Tolko Industries is revisiting the past with its Innovative Phase Logging program in the B.C. 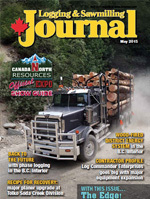 Interior, and it is delivering detailed—and valuable—information on logging equipment performance and production. A major planer upgrade at Tolko’s Soda Creek Division stud mill operation in Williams Lake, B.C. is going to help expand its range of products and improve grades and recovery at the mill, a solid recipe for improved competitiveness. Northeastern B.C. logging company Hi-Sky Enterprises has introduced some new Komatsu machines into its logging equipment line-up to provide their employees with the latest in logging tools, and make sure they are able to keep moving wood efficiently to meet the needs of their customer, lumber giant Canfor. New logging operation Full Tilt Contracting is looking forward to doing exactly that—going full tilt—in the not too distant future, helped along by solid logging equipment and an experienced crew. Attendees at the recent Small Log Conference got a first-hand look at Idaho Forest Group’s new Lewiston, Idaho upgrade and its focus on a HewSaw SL250 3.4 installation that is already cranking out six million board feet a week—with room for more production. A new wood-fired district energy system in the B.C. Interior is delivering multiple benefits, including solving the issue of residue disposal from a local sawmill using a Bandit 1390 XP 15 inch drum chipper, and in the process delivering energy that has a greener footprint. Having had success manufacturing and marketing red pine product, Ontario’s Heideman sawmill recently made some acquisitions, and has now taken charge of marketing its finished white pine product. It was the forest industry’s version of the kid in the candy store as Idaho Forest Group (IFG) recently unveiled its new Lewiston, Idaho HewSaw SL250 3.4 installation to over 100 attendees of this year’s Small Log Conference. Billed as the largest HewSaw installation in North America, the high tech wonder has been the talk of the Pacific Northwest forest industry for months. In operation for close to a year during the pre-conference tour in March, IFG had run its first log through in April 2014. The new set-up is already cranking out six million board feet per week, with room for expanded production. Mill manager Jesse Short is clearly impressed with the new Finnish line so far. “It’s a wood-eating machine,” Short said of the HewSaw. The saw, laid out in a well-lit football field-length building, can handle logs from 4 inches to 16 ½ inches, top end, to a maximum log diameter of 21 ½ inches. It can process log lengths from eight feet to 20 feet, and has a line speed of 200 to 650 feet per minute. The production line includes a Login system, four-sided cant chipping, a cant saw, ripsaw and cross saw, along with two board separators for edged sideboards, and a cant turner. The cant height specs are 3 inches to 15 3/8 inches; width in the chipper canter, 3 inches to 15 3/8 inches; the cant height in the rip saw, 2 ½ inches to 10 ½ inches; and the cant width in the rip saw, 3 inches to 15 3/8 inches. The Lewiston line uses board separators to move edged sideboards on to conveyors running parallel to the HewSaw. Lumber from the center cant and the side board production all meet back up at the end of the line. 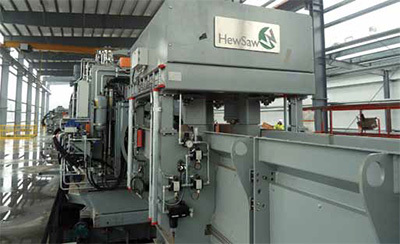 Overall, the HewSaw can process multiple products, manufacturing up to eight edged sideboards from each log. 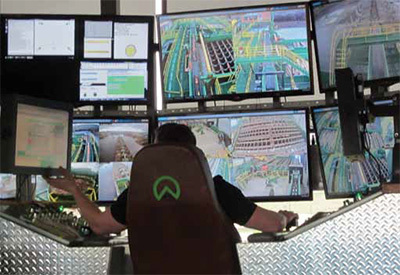 The efficient system is monitored from a spacious perch up above the mill, where the operator has a wide-angle view of the mill’s activities. Here, the operator handles the infeed, watching several screens that give real time views of each machine centre. The key companion equipment to the HewSaw, a Springer-Microtec CT log scanner, is no small part of the new mill set-up, scanning each log at a blazing three rotations per second. The scanner conveyor speed of 525 feet per minute makes the log scanner 100 times faster than your regular medical scanner. Calling the CT unit nothing more than a huge medical scanner, Springer-Microtec representative Norvin Laudon explained that the goal is to see all the defects in each log, evaluating knots, cracks and wane, which can affect total log quality. Right now, the scanner is only used for sorting and bucking, with future plans for optimization in sawing. As it creates a total three-dimensional profile for each log, the scanner focuses on features and properties of wood species common to the Intermountain West. 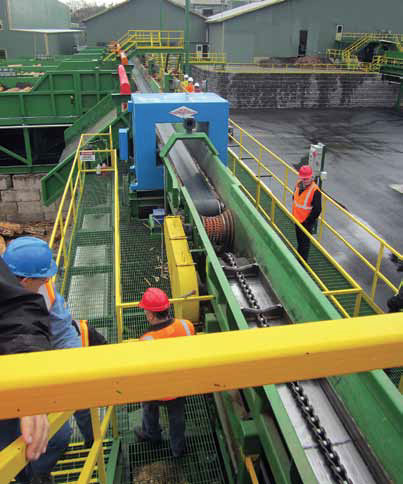 Equipped with what is said to be the largest HewSaw installation in North America, the high tech wonder IFG Lewiston sawmill ran its first log through in April 2014. The new set-up is already cranking out six million board feet per week, with room for expanded production. “The CT scan determines how the log is bucked and sorted,” said Laudon, explaining that Springer-Microtec optimization software calculates the cutting pattern with the highest yield, quality and value. Once both Logeyes are running, IFG’s production line should be running at up to a brisk 360 million board feet a year. Last year’s performance was already at 220 million board feet. Tyler Levy is a technical advisor with HewSaw, and he has worked with Jesse Short and others to fine tune the new mill. HewSaw’s Levy came on board with the project soon after IFG bought the old sawmill from Potlatch Corporation in November 2011. At that point, IFG just ran the old mill, before clearing 14 acres and investing over $25 million into the new installation, which also boasts a state-of-the-art hydraulic power unit by Bosch Rexroth Canada, new conveyors and a Nicholson A8 high-speed debarker. Rawlings Industrial of Spokane was in charge of equipment installation. Additionally, IFG is just about ready to move into its 6,600 square foot office/planning building. Interestingly enough, the Lewiston mill site is no stranger to innovation. The old sawmill purchased by IFG was originally built by Weyerhaeuser in the 1920s as a spin-off from the largest white pine mill in the world, built at Potlatch, Idaho in 1906. Potlatch Forest Industries engineer Robert Bowling invented the revolutionary Pres-to-Logs at the Lewiston facility in 1929, and from there, Pres-to-Log machines went worldwide. Ironically, the Small Log Conference tour kicked off its bus tour at the Purcell Premium Pellet mill, which still operates several Pres-to-Log machines at its Moyie Springs, Idaho location. As industry visionaries of the 1920s watched the last log drive on the Clearwater River (adjacent to the new IFG mill) in the 1970s, probably none could imagine the high tech sawmill that IFG would operate at the same location. And certainly none could imagine a mill running with less than a dozen people. “It just blows your mind, even if you come from a sawmill background,” Russ Vaagen said of the IFG mill. Vaagen, vice-president of Vaagen Brothers Lumber in Colville, Washington, knows HewSaw equipment and small log milling first-hand, as the family-owned company has operated the Finnish-built saws for years. Short noted that major challenges were related to controls and optimization. “We had never controlled a line with so many axes of motion and this level of sophistication,” he explained, adding that there were challenges optimizing fibre yields, as well as production costs between the different modes of operation. Other tweaks to the system included the tuning of multiple control systems and hydraulic systems. 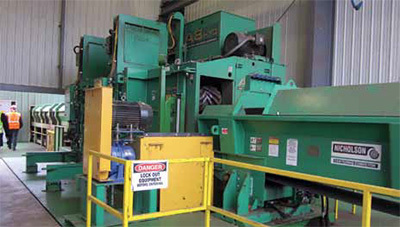 The recent IFG Lewiston upgrade included the installation of a Nicholson A8 high-speed debarker (above). Next in line in terms of mill improvements will be a new planer, new shavings bins, and ultimately a remodel of the old large log mill. With plenty of wood fibre out there, IFG will nevertheless have to compete for logs, especially with so much of the surrounding area locked up in national forest. “I think Potlatch Corporation has a good plan on their lands,” Short assessed. “The State of Idaho does a good job, and their volumes could likely improve. We’ve seen some improvement on the federal side of things and expect that has the most upside potential. “For us to reach our potential, supply will have to increase, or usage within the wood basket would have to change. I think there is more private wood available and if the market helps the landowners, it will also come to market. The Idaho Forest Group is counting on new equipment and the new production process to pay off in increased productivity and reduced production costs at its Lewiston, Idaho sawmill.